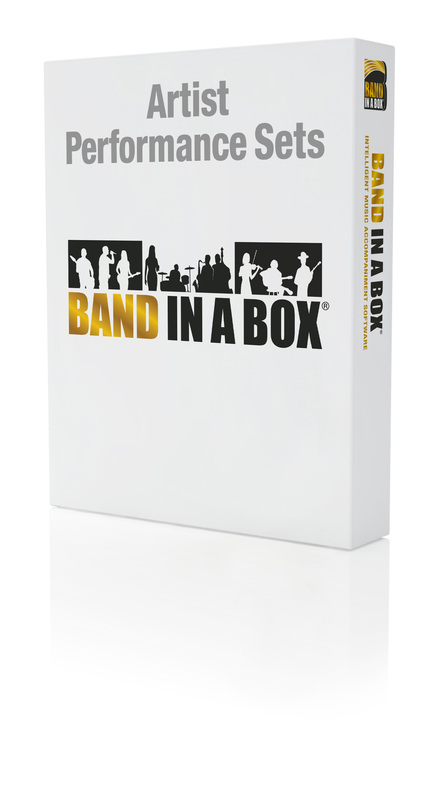 These are collections of Band-in-a-Box® RealTracks demo songs, which have artist performances on the Melody track. They are different from a "RealTracks" track since they aren't generated by Band-in-a-Box®, but rather are recordings of the Artist playing melodies or solos along to the Band-in-a-Box® generated accompaniment tracks. Artist Performance tracks are great for learning-from-the-Pros, since all the Tracks include audio (stretchable to any tempo), notation, on-screen guitar, and guitar tab. Performances typically have a melody for two choruses, followed by a solo for two choruses (one simple chorus and a second advanced chorus). We've made it easy to get ALL the Artist Performance tracks - they are all included in the UltraPlusPAK, EverythingPAK and Audiophile editions of Band-in-a-Box®. In Artist Performance Set 7, there's a wide variety of musical styles and each song has its own unique solo. The Instruments in this set include Flute, Tenor Sax, Alto Sax and Clarinet and you can view the exact notation for each instrument in the notation window. With Band-in-a-Box and RealBand you can use the tempo stretching abilities to slow down and master each solo at 1/2 speed or 1/4 speed, then bring it back to the regular speed and play like a Pro! The musical styles in this set vary from Afro-Cuban Bolero to some 60's and 70's Soul music and EZ Listening to Jazz Funk. Or maybe you want to learn some saxophone solos in a Reggae style or a Flute solo you can play around the campfire. There's also a Guajira style with two Flute parts and a Guaracha style with a Flute and Saxophone harmonies. With each solo a unique recording that is embedded in the song, the solo doesn't get regenerated like the rhythm section does when you press play. What ever style of music you're looking for, Artist Performance Set 7 has all the variety you need to learn or just enjoy. This demo features a 2 part Flute Harmony playing at a medium tempo with an even feel. The Flutes start the song together and then they each play a chorus and then return together for the final chorus. The band playing behind the flutes are all RealTracks and they include an acoustic bass, and a finger picking and a strumming acoustic guitar. The Flutes have a classic bright warm tone and play a combination of quarter notes and eighth notes. This EZ listening song features a Tenor Sax Solo playing at a medium tempo with a swing feel. The other instrument playing along are all RealTracks and they include an acoustic bass, acoustic piano, acoustic guitar and Jazz RealDrums. The Tenor sax has a warm tone and plays a combination of eighth note and sixteenth note runs. This solo relaxing song features a Clarinet Artist Performance Track playing at a slow tempo with an even feel in a Pop Ballad style. The other instruments playing along are all RealTracks and they include an Electric Bass, Acoustic Strumming and Finger picking Guitars and Nashville RealDrums. The Clarinet has a warm tone and plays long held notes as well as eighth note runs and fills. This smooth Reggae style song features two Saxophones playing a harmony with a slow swing feel. The band playing with the Artist Performance Tracks are made up of all RealTracks and they include an Electric Bass, Acoustic Piano, Electric Guitar and B3 Organ. The Tenor and Alto sax blend seamlessly together and play a combination of eighth notes and Sixteenth notes. This sweet 70’s soul style features an Alto Sax soloist playing an Ev16 style at a medium tempo. All RealTracks are playing along including an Electric Bass, Two Electric Guitars, Piano Synth Layer and Soul70s RealDrums with Percussion. The Sax has a bright tone and combines 8th notes and 16th notes with some blistering fast runs. Artist Performance Set 6 is full of traditional Irish Folk songs with multiple parts performed by the sensational multi-instumentalist Quinn Bachand. There is a unique offering in this Artist Performance Set as we have included a simple level version for 6 of the songs as well as the advanced version. Also, there are multiple Artist Performance tracks included in some of the songs. Each Artist Performance track has been recorded specfically for the songs and will remain the same. Each Artist Performance track is expertly notated to show exactly what is being played. The audio can be slowed using Band-in-a-Box's amazing tempo stretching and you can follow along with the notation at a slower speed until you are ready to play at the original tempo. The instruments included in this Artist Performance Set are Acoustic Guitar and Banjo with some songs including both playing an amazing two part harmony. With such a rich offering of traditional songs expertly played, Artist Performance Set 6 has the ability to teach new comers to Irish music as well as long time fans alike. This Up-tempo Irish traditional Jig features Artist Performance Tracks of the Banjo playing the melody and an Acoustic Guitar playing the rhythm section. The other instruments are RealTracks and they include an Acoustic Bass and a traditional Irish Bodhran drum. The Banjo has a warmer tone than other banjo’s and plays a combination of eighth notes and sixteenth notes. A medium tempo Irish Jig with an Artist Performance track rhythm Acoustic Guitar and a solo Banjo playing with a swing feel. The other instruments are RealTracks and they include an Acoustic Bass and a traditional Irish Bodhran drum. The Banjo plays a relaxed style and has a crisp, warm tone. This fast paced traditional Irish Reel is played includes a Banjo solo playing in a swinging gypsy style. The rest of the instruments playing are all RealTracks and they include an Acoustic Bass, Tenor Banjo, Acoustic Guitar and RealDrums. The Banjo has a crisp sound and is playing mainly sixteenth notes throughout. A Medium Tempo Irish Reel featuring a Banjo playing the melody and an Acoustic Guitar rhythm track. The other instruments playing along area RealTracks and they are an acoustic bass, and a traditional Irish Bodhran drum. The Banjo plays an intricate melody of sixteenth notes with flourishes added. This Traditional Irish Reel features two Artist Performance Tracks, one Rhythm Acoustic Guitar and the other a solo Banjo all playing with an even feel. The other instruments playing along area RealTracks and they are an acoustic bass, and a traditional Irish Bodhran drum. The Banjo has a mellow tone and plays fast sixteenth notes the whole song. In Artist Performance Set 5 you get the expertly crafted Fiddle and Mandolin solos from Andy Leftwich playing some wonderful Bluegrass! Artist Performance Set 5 you get 18 songs with a wide selection of known traditional songs including Amazing Grace, Scarborough Fair, Londonderry Air, Oh Susanna and many, many more! These solos have been recorded and embedded in the song and then notated to show you exactly what is being played on the Fiddle and Mandolin. You can use the amazing tempo stretching abilities to slow down the audio with out changing the pitch, allowing you to practice at a slower tempo to get the solos just right. Slowly return the tempo to normal and now your playing like a pro! Some of the songs have two variations; Amazing grace has a slow swing waltz and an uptempo even waltz. For all the Mandolin and Fiddle players, and all the others who just want to learn some Bluegrass style soloing, Andy Leftwich in Artist Performance Set 5 is an amazing learning and performance tool. This is a more modern take on the traditional hymn, with a quicker pace and an even 8ths groove. The fiddle begins improvising over the changes starting at the second chorus, with melodic passages that still hearken back to the original melody. At the third chorus, he improvises in an almost baroque manner, with steady 8th-notes. In this Demo we have an uptempo Fiddle playing a solo with an even feel and a Bluegrass style. The other instruments in the Band are all RealTracks and they include an Acoustic Bass, Acoustic Guitar and Mandolin. The Fiddle has a bright tone and combines 16th note single note runs with some double notes at times. A traditional song done in a Bluegrass style, this Fiddle solo is played at a ballad tempo with an even feel. The other RealTracks backing the Fiddle include an Electric Bass, Acoustic Piano, 12-String Acoustic Guitar, a Background Cello and RealDrums. The Fiddle has a warm acoustic tone and combines single quarter notes and eighth notes with some double notes played as well. This classic tune is being played as a solo by a Mandolin with an even feel in a Bluegrass style. The backing tracks for this tune are made up of all RealTracks and they include an Acoustic Bass, Acoustic Guitar and a Rhythm Mandolin. The Mandolin solo is played in the low key at the start very simply and then from the second chorus on the playing picks up, moves up the register and is more intricate. A recognizable classic traditional song, this Fiddle solo is played at a medium tempo and with an even feel in a Bluegrass style. The other instruments making up the band are all RealTracks which include an Acoustic Bass, Acoustic Guitar and Mandolin. The Fiddle has a warm tone on the low end and a bright tone in the higher notes and the tone suits this style of Bluegrass perfectly. Artist Performance Set 4 gives you 16 incredible songs, each with a unique Electric Guitar solo from studio session great Brent Mason. These Artist Performance songs cover a wide variety of electric guitar styles with each song a unique style. These styles include a Waltz, Country Boogie, Honky Tonk Country, Texas Blues Rock and New Orleans Pop and Boogie. There are also a selection of slow ballads which include a Slow Country style, a Driving Country style and a 12-8 Texas Blues style. Each of these electric guitar solos has notation which shows exactly what is being played by Brent Mason. This means you can use the amazing audio stretching features in Band-in-a-Box to slow down the audio with out changing the pitch and learn to play along with Brent Masons solos. Each song in Artist Performance set 4 has a solo that was specifically recorded for that song. With one of the best studio musicians around playing this great selection of solo styles, you can use the Artist Performance tracks to increase your playing abilities in no time at all. This Artist Performance song features Brent Mason playing Country Boogie electric guitar with a swung eighth-note feel. Brent uses pinch harmonics, bends, and interesting chord voicings to create a sophisticated and upbeat country boogie sound. For the melody (1st & last choruses), there is a single-note line for the 1st 16 bars, after which it switches to jazzy block chords. This Artist Performance Series song features Brent Mason on electric guitar. Brent uses double-stops and slides to create an expressive medium Country swing feel. A delay with strong feedback is used in conjunction with the clean, twangy guitar tone. This Artist Performance Series song, featuring Brent Mason, is a Slow Country Ballad. Brent uses a minimalist approach, playing slow melodic lines and harmonically pleasing double-stops with the occasional bend. The guitar tone is very ethereal with moderate levels of reverb and delay. This demo features the TexasBluesRockSlow 12/8 RealTracks rhythm section. This demo is great for practicing soloing. This song uses a standard 12-bar blues progression in the key of E. The chords are just major triads, but the musicians will usually be playing a dominant 7th, especially at the turn-around. This Artist Performance Series song, performed by Brent Mason, has a fast Western Swing style. The bass focuses on playing half-notes with a few quarter-notes mixed in while the rhythm guitar emphasizes the back-beat. Brent plays a pleasing combination of double-stops and slides that lend to the style with the occasional bend making an appearance. The guitar tone is clean with a fast slap-back delay. With Artist Performance Set 3 you get a huge selection of Fiddle Solos played by the amazing Daniel Lapp, expertly notated, playing a wide variety of classic Celtic songs. There are 26 Celtic songs included in this Artist Performance Set and each song is either a Jig, Reel, Waltz or a Hornpipe. Each song has a uniquely recorded Fiddle solo with exact notation which can be viewed in the notation window. Easily slow the tempo of the song down using the Relative Tempo window in Band-in-a-Box or RealBand and practice the solo until you get it right at that tempo. Then slowly increase the tempo until your back at the regular tempo. You just learned how to play like a professional! These Fiddle solos have been recorded specifically for each song and do not get regenerated like the rhythm sections when play is pressed. If you play the Fiddle or another instrument, you can learn some amazing Celtic solos with Artist Performance set 3. This Fiddle solo is accompanied with a trio of RealTracks which include an acoustic bass Celtic Hornpipe, acoustic guitar Celtic Hornpipe and Bodhran Celtic Hornpipe. The Fiddle solo is sixteenth note based and is played with a warm tone and smooth attack. The Fiddle solo is backed by a trio of RealTracks. These include acoustic Celtic Reel bass and guitar and Bodhran RealDrums. The fiddle is triplet based sixteenth notes and has a classic bright tone. This Fiddle Solo is backed by a trio of RealTracks which include Acoustic Bass and Guitars Celtic Reel and Bodhran RealDrums. The Fiddle is based in 16th notes and has a classic bright sound. This Fiddle Waltz solo is backed by the RealTrack Acoustic Guitar Celtic Slow Waltz Fingerpicking. The Fiddle is eighth note based with a classic bright tone. This Fiddle solo is accompanied by a trio of RealTracks which include Acoustic Bass and Acoustic Guitar with RealDrums Bodhran. The fiddle plays an eighth note based phrases with a warm tone. In Artist Performance Set 2 you get a collection of Smooth Jazz, Dixieland and Gypsy styles of music to choose from in a wide tempo range. Each song in the Artist Performance Set has a uniquely recorded solo to play along with the chord progression. Each solo has been expertly notated and can be viewed in the notation, guitar or piano windows. In Artist Performance set 2 the solo instruments include Clarinet, Flute, Tenor Sax, Soprano Sax, Alto Sax, Electric Guitar and Acoustic Guitar. Each style of music has a wide tempo range and if you want to learn the solo they can be slowed down while the pitch is kept the same using Band-in-a-Box's amazing tempo stretching abilities. In this Artist Performance set you get 14 songs, each with a solo that will stay exactly the same and does not regenerate like the rhythm section when 'Play' is pressed. If you're looking to learn some Smooth Jazz electric guitar or saxophone solos or if you're wanting to work on harmonizing with a Gypsy Jazz solo or a Dixieland solo, try Artist Performance Set 2. A fast paced Electric Guitar solo playing a swinging Dixieland style while being backed by a band made up of all RealTracks. These RealTracks include a Tuba, Acoustic Piano, Acoustic Guitar, Tenor Banjo and Drums. The Electric Guitar plays a combination of 8th notes and quarter notes with some triplets added as well. The guitar has a classic mixture between warm and bright tone which you can hear when transferring from low notes to higher notes. This song features a Clarinet solo accompanied by a trio of RealTracks. These include Acoustic Jazz Ballad Gypsy Jon Guitar and Bass with Acoustic Jazz Fast Gonzalo Guitar as well. The Clarinet plays eighth notes mainly with some eighth notes as well. The clarinet has a warm tone which uses the full clarinet range. This Soprano Sax solo is played with a smooth jazz feel and is accompanied by Smooth Cool RealTracks. These include electric bass, electric piano, electric guitar and Smooth Jazz Cool RealDrums. The Soprano Sax plays a sixteenth note based solo with eighth notes played as well. The soprano sax has a classic tone. This Alto Sax solo is accompanied by Smooth Cool electric bass and electric piano. RealDrums are Smooth Jazz Cool Sw 16 playing blastix and hihat in the A section and switching to snare and ride in the B section. The Alto Sax solo is sixteenth note based with eighth notes played as well. The alto sax has a bright tone with a crisp attack. This Electric Guitar is playing a solo in a Smooth Jazz Even 16 style. The backing tracks are made up of all RealTracks and they include an Electric Smooth Poppy Bass, Electric Piano, and RealDrums. The electric guitar has a clear tone with a mix of low and high tone. Artist Performance Set 1 offers a diverse collection of Jazz Swing and Bossa songs which have been accompanied by a soloist. The expertly played solo instruments include Tenor Sax and Alto Sax, the Flute and Clarinet as well as Electric Guitar. In Artist Performance set 1 you get 22 songs, each complimented by a unique solo performance specific to each song. When 'Play' is pressed in Band-in-a-Box or RealBand the rhythm section will (re-)generate, but the soloist will stay the same, frozen as an 'Artist Performance Track'. Each solo is expertly notated so you can follow along in the notation window and see exactly what each solo instrument is playing. The styles of Jazz in this set include Bossa, Jazz Swing from Ballad to Bebop, as well as a variety of Jazz Waltz numbers. Use the amazing ability of Band-in-a-Box to easily slow down the solo to 1/2 or 1/4 speed while staying in pitch, which allows you to practice the Artist Performance track and get it perfect. Artist Performance set 1 is a great opportunity to learn or play along with some master Jazz solos. An eighth note based Bossa Flute solo played at a medium tempo with a trio of RealTracks. These RealTracks include acoustic bass and piano Bossa and Terry Clarke Bossa RealDrums. The flute solo is played with a light easy feel and incorporates the entire range of the flute. Tenor Sax solo with a slow swing Jazz trio with ac. piano, ac. bass & drums (with brushes). Simple bass throughout (in '2' at 'a'). Piano plays '4 to the bar' left hand. The tenor sax solo has a warm smooth tone and plays mainly eighth notes and quarter note with some sixteenth note runs included. Alto Sax solo played with a trio of swinging Jazz RealTracks. These include the Jazz RealTracks acoustic piano and acoustic bass and Jazz Brushes RealDrums. The Alto Sax solo is eighth note based with some sixteenth note runs and has a tight, bright sound. This fast paced Clarinet Solo is backed by a trio of RealTrack instruments. These include Acoustic Bass, Acoustic Piano and RealDrums Jazz Brushes. The Clarinet solo plays high energy with a mixture of quarter note and eighth note based phrases. The Clarinet has a classic tone and covers the entire note range. This uptempo Electric Guitar solo is backed by a full RealTracks band all playing a swinging Waltz style. The Electric Guitar plays an interesting mix of medium tempo melodic phrases with quick runs up the fret board. The Guitar has a warm tone which sounds great with Jazz music.